Don’t get boxed in with chart wizards or just-add-data pre-fab visuals. For great data visualizations, one size does not fit all. Ask yourself: what different kind of visualizations will tell the most truthful story, and best answer the questions at hand? 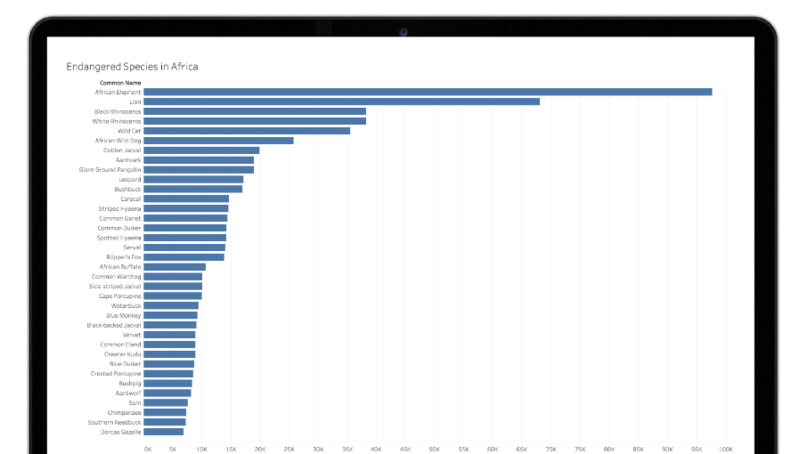 Bar charts are best utilized when you have a single measure, and want to compare categories. Bullet charts, reference lines, bands, and distributions focus attention on targets. Histograms and box plots show where your data is clustered, and can compare categories. Visualize data on geographical maps to answer locational specific questions, or aid geographical exploration, not just because it looks nice. Use subject matter shapes to tell a more compelling story. 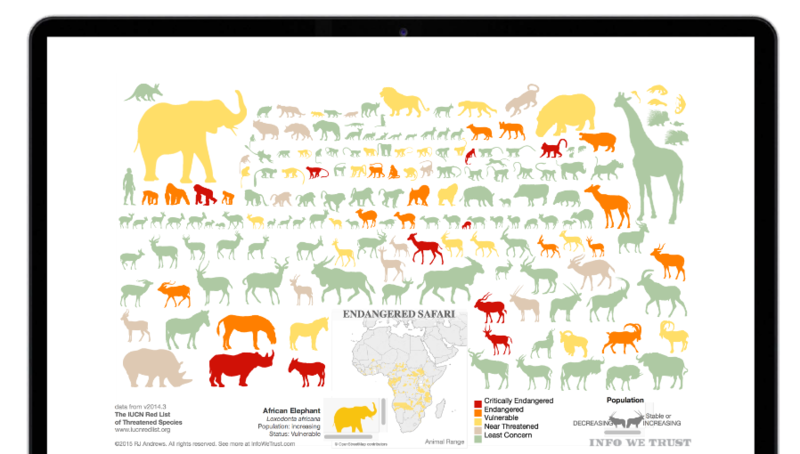 This visualization shows the number of records for different endangered species listed in Africa, but the animals themselves are lost in the story. Color is one of the most powerful aesthetic features because it’s an attention-grabber. It’s the first thing we notice, and it can immediately highlight specific insights or identify outliers. The data, not personal favorites or brand colors, should drive the use of color to make a point. Don’t use similar colors, or too many colors. Don’t re-use colors for different dimensions or measures on the same dashboard. Does the color scale match my data? Does the color move from light to dark, or is it stepped to best represent what you’re measuring? Semantically-resonant colors help people process information faster. So use yellow to depict bananas, red to represent heat. This dashboard contains data from 100 observations of global surface temperatures (°C) around the world from 1961- 1990. 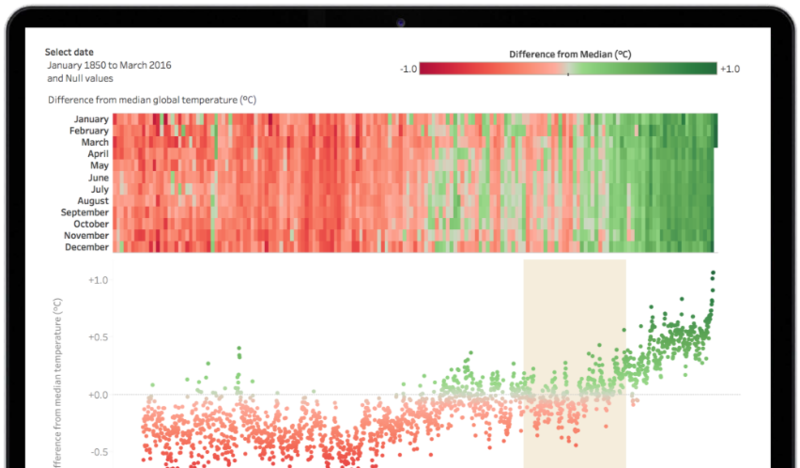 While these visualizations are accurate, the color red represents cooler temperatures, and doesn’t resonate with the information the data is trying to portray. The bigger the object, the bolder it looks. Bold shapes and colors might work well with bar charts and area charts, but they may also look gaudy and garish when used in a different chart, like a treemap. Use size to draw emphasis to your key message, not obscure it. If the difference between data points is very minimal or very great, size may not always be a good encoding tool, as the visuals may become hard to read. Mark size should be based on the range of values on the map. 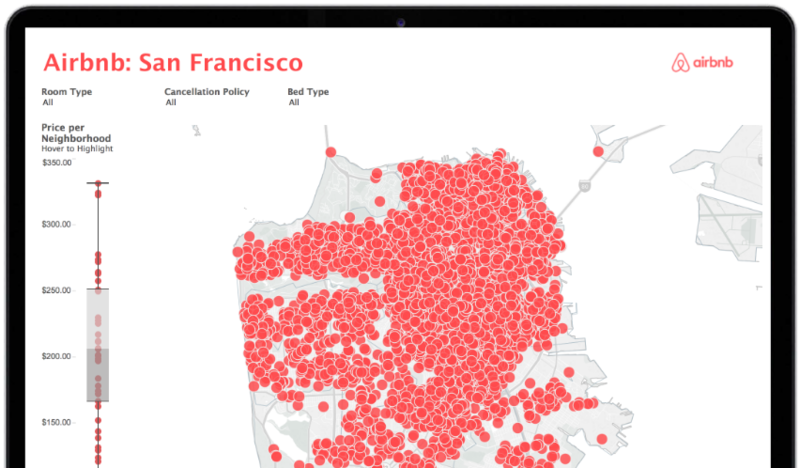 This visualization shows San Francisco Airbnb listing data on a map. Because all of the listings are the same size and color, even with filters, it’s hard to differentiate the value between the listings at a glance. Readability is essential. Make the most important information stand out. Keep them short, but powerful. Convey the point, message or story in the fewest words possible. Find the sweet spot. Too many mark labels can be very distracting. Try labeling the most recent mark, or min/max. Save additional and more detailed information for tooltips. 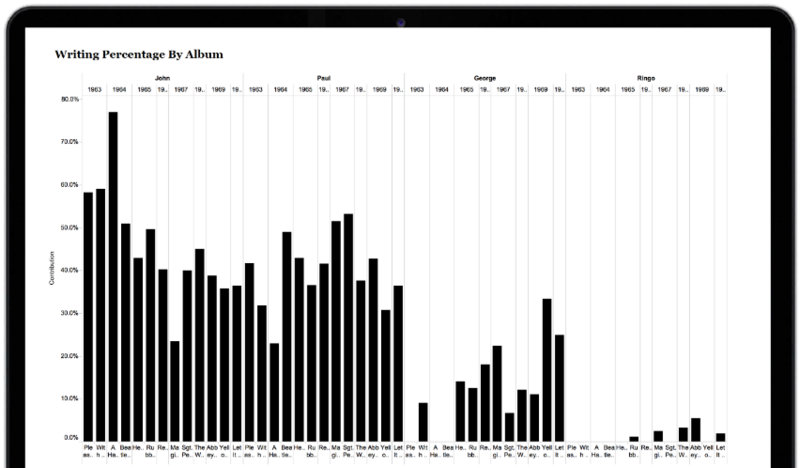 This data visualization will show you which Beatle wrote what song.This bar chart is pretty good, but because there’s a lot of text, the names of the albums get cut off—immediately taking away from the purpose and the fun of this visualization. Your dashboard’s purpose is to help guide the reader’s eye through more than one visualization, tell the story of each insight, and reveal how they’re connected. The more you employ better dashboard design, your users will discover what’s happening, why and what’s most important. Take into account how you’re guiding their eyes across the dashboard. Are you showing the user where to look next? Don’t leave people high and dry without guidance on how to use a visualization. Try swapping a filter title with explicit language directions about how to navigate. Don’t make a lot of important information compete for attention. Most of the time, more than three visualizations on one dashboard is too many. 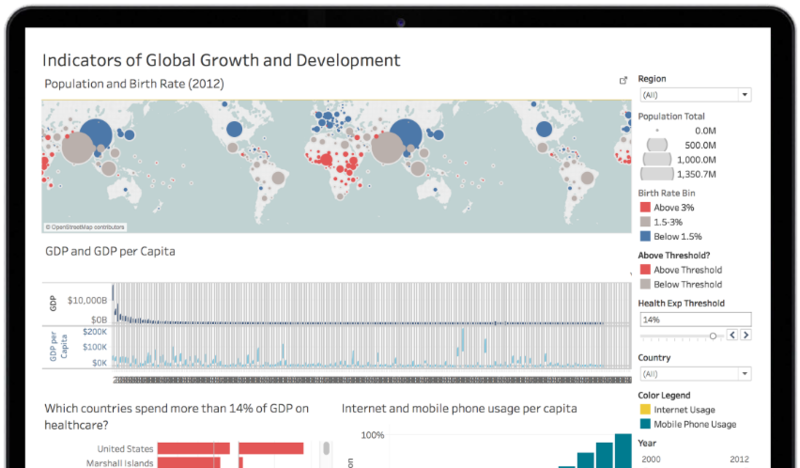 If you need more than one dashboard, or are preparing for a presentation, connect the different visualizations with story points. 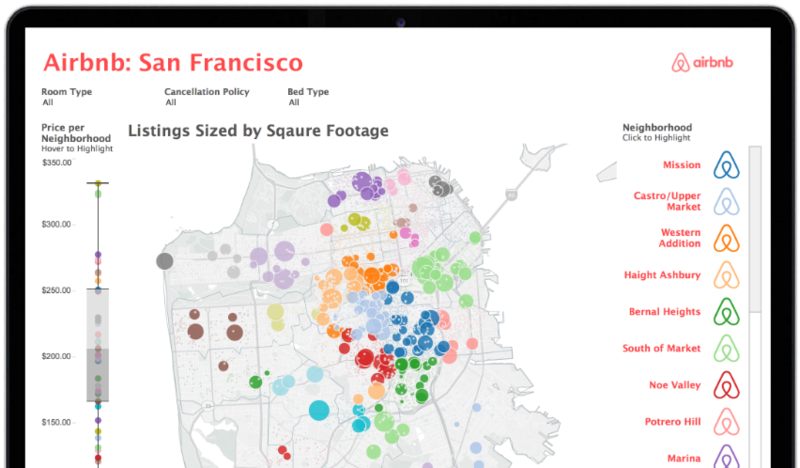 Tell the narrative of your data with visuals that build on each other, highlight specific insights, and provide additional context, all in one seamless presentation. It sure beats cutting and pasting static images into a power point. 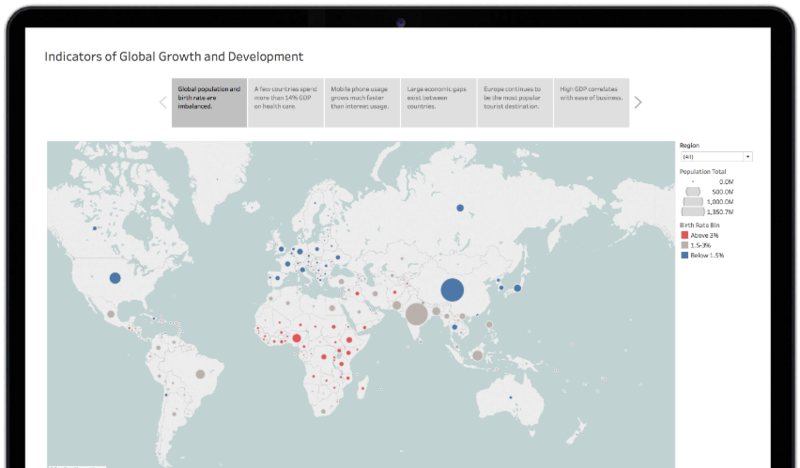 This dashboard shows global growth and development indicators, but it has four visualizations crammed into a single place. These story points allow for indicators and insights to be explored in depth for each visualization in a more organized way. Click on the dashboard to see story points in action. 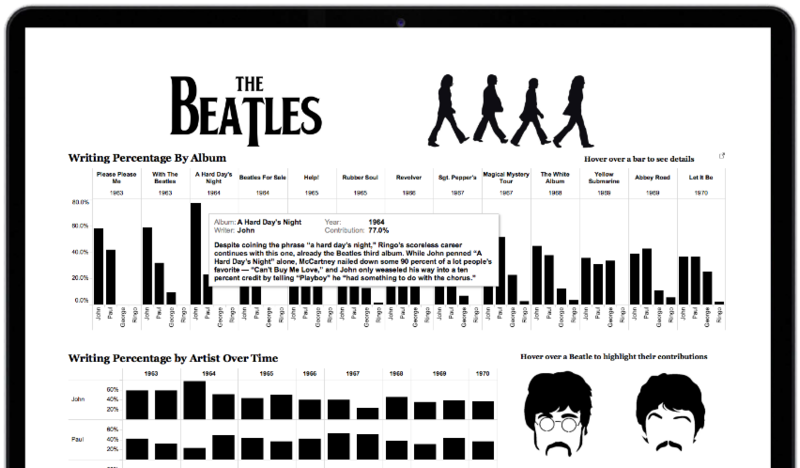 Great visualizations will not only help you understand more about your data, they’ll offer faster, more meaningful answers, and even inspire others to ask and answer new questions. Get inspired every day with one new and amazing data visualization, delivered right to your inbox. Subscribe to Viz of the Day to learn more about visualization best practices.